Step 1 Heat the oven to 375 degrees and grease each of two (8-inch) loaf pans with butter. Line the bottom of each pan with parchment paper, and grease the top of the parchment paper with butter. Step 2 Wash the blueberries and drain. Lightly dry with a paper towel and place in a small bowl. Toss the berries with 2 tablespoons of the flour to coat. Set aside. Step 3Place the remaining flour into a large mixing bowl and whisk in the baking powder, salt, baking soda and sugar. Set aside. Step 4In a medium bowl, whisk the eggs, then whisk in the milk and vanilla. Finally, whisk in the 1 cup of melted butter. Step 5Make a well in the center of the dry ingredients, and pour in the liquid ingredients. Stir the ingredients together lightly just to combine; do not overmix the batter. Lastly, gently fold in the berries. Step 6Fill the loaf pans evenly; they should be just over half full. Place the pans in the oven and bake until done, about 50 minutes. Check the bread every 10 minutes after 30 minutes; if it begins to color too quickly, tent it lightly with aluminum foil. In Recipes-list.com we have selected the most viewed recipes from category - Breads Breakfasts . Enjoy the best recipes specially selected for you! 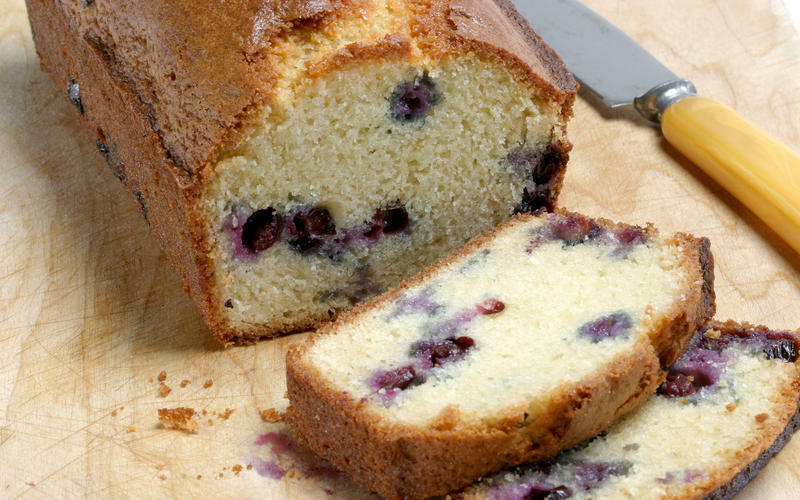 Blueberry breakfast bread is the right choice that will satisfy all your claims.